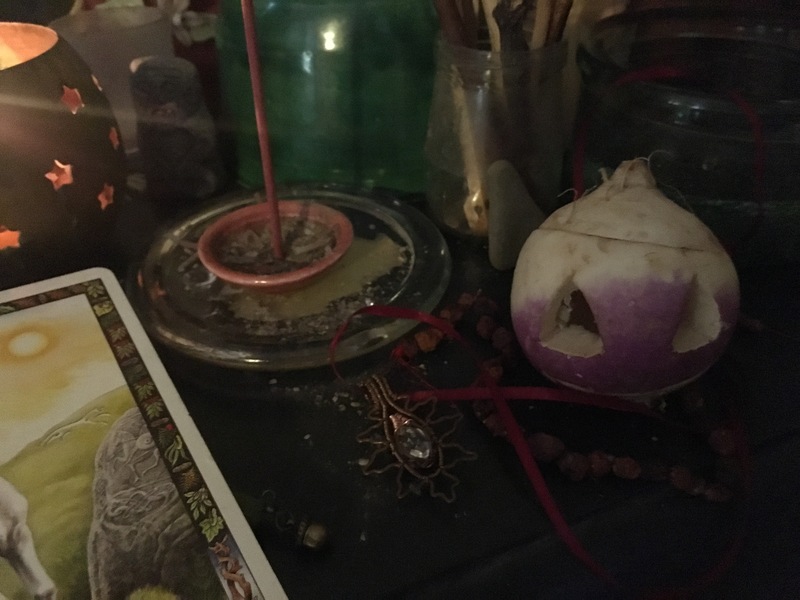 Our Winter Solstice altar – photo by Grey Catsidhe, 2016. I’m finally enjoying a somewhat lazy day today. I slept in and have very little to do besides clean and work on some personal projects. I did take advantage of my freedom and caught up on some grove business. It gave me some time to reflect on what Northern Rivers Grove accomplished by offering our Winter Solstice ritual online rather than cancel due to threat of poor weather. I would have preferred to enjoy a more physical gathering complete with our annual gift exchange and usual, delicious potluck, but doing this enabled us to keep with Isaac Bonewits’ vision of offering public rituals, even broadcasting them. You can read more about the experience in the link above. It was amazing to connect with a couple people, including a distance member, from other states. We’re discussing the possibility of streaming more of our rituals. Considering that older, more experienced groves (like Three Cranes) are doing it, it makes me really proud of what we are able to accomplish. As we near the end of the secular year, and enter a new lunar phase at this critical time, I’ve been especially reflective about my spiritual development. I realize that I’ve put a lot of my energy into transforming my protogrove into a grove, and facilitating as much as possible to keep us active despite some of the challenges we’ve collectively faced. My personal spirituality started out really strong at the beginning of the year. I was more actively working on study programs, but between work and motherhood (same old, same old, I know), I found myself putting grove business first to keep it healthy and growing. I don’t really think that doing so has been detrimental. It’s actually been extremely helpful in enabling me to develop my understanding of ADF liturgy, group magic, and divination. Honestly, I think running a grove gives me an edge when it comes to completing certain exit standards in my education within ADF – so the work I put into Northern Rivers does not detract from my studies, but with my other life demands. My concern is that I’ve let my hearth practice slip. I’ve continued to keep up with my morning and evening devotionals for the most part. I have brief lapses due to visiting family, illness, or other disruption to routine, but I’m proud of my discipline for the most part. I had high hopes that I would really develop my trance skills. I was for awhile, as documented here on my blog, but then I gradually did less and less. Why? Some of it has been laziness. Why do I spend so much time staring at the abyss that is Facebook? Some of it is that I’ve been incredibly inspired recently. I’ve started to write fiction again – something I haven’t done with so much vigor and passion in years. Of course, with the holidays, I’ve filled much of my remaining spare time with sewing and crocheting gifts. I need to refine my discipline and rededicate myself to my personal practice. Maybe an oath with repercussions is in order? I also realize that I need to strengthen my bonds with Brighid and continue to give offerings of gratitude for all the inspiration she has blessed me with. I’m envisioning magic to strengthen my creativity, crafting a trance tool that I’ve been dreaming of, and actually getting outside more. All of these activities will feed my soul, make me a better Druid, and ultimately benefit my grove.